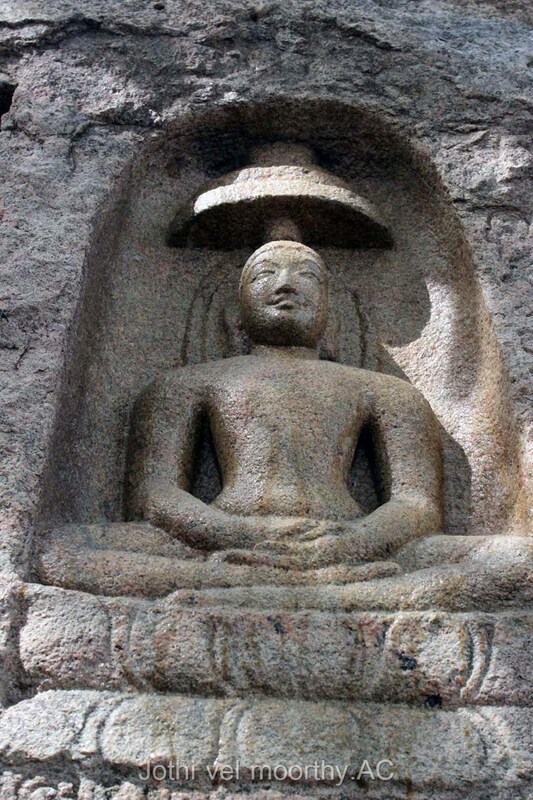 Woke up around 5AM and started moving by 6AM with plans to cover till Ettayapuram. 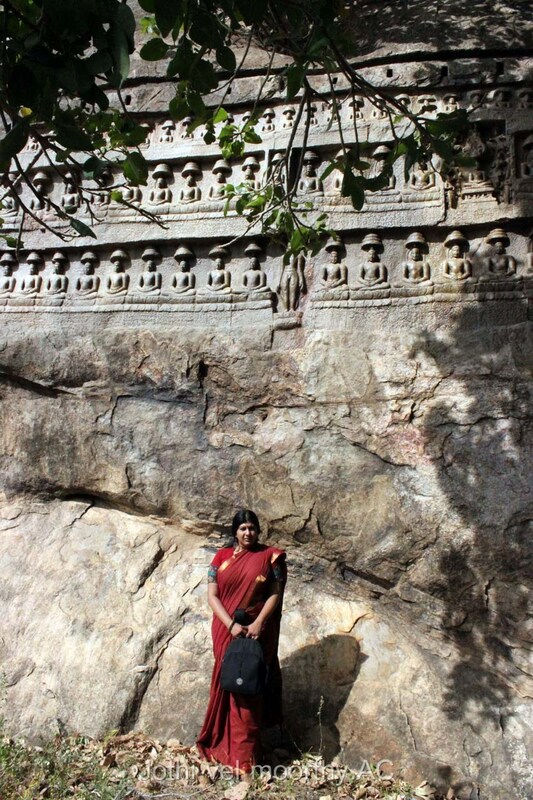 Kazhugu malai was our first destination. 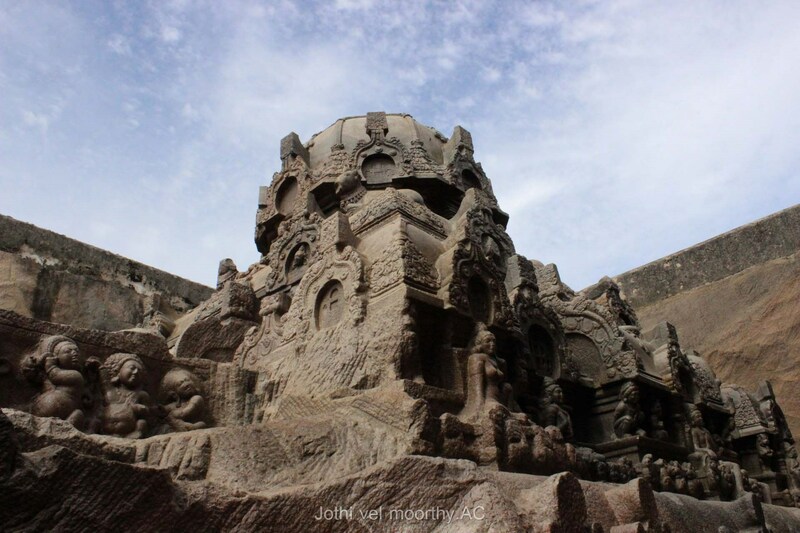 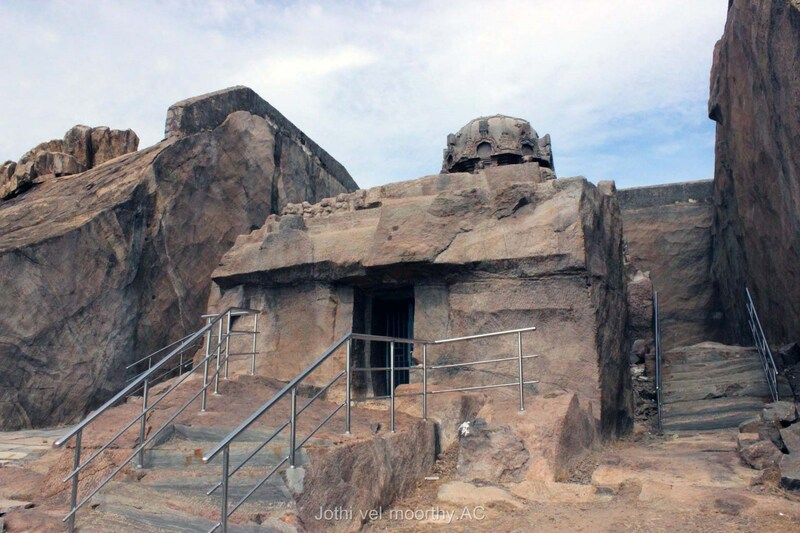 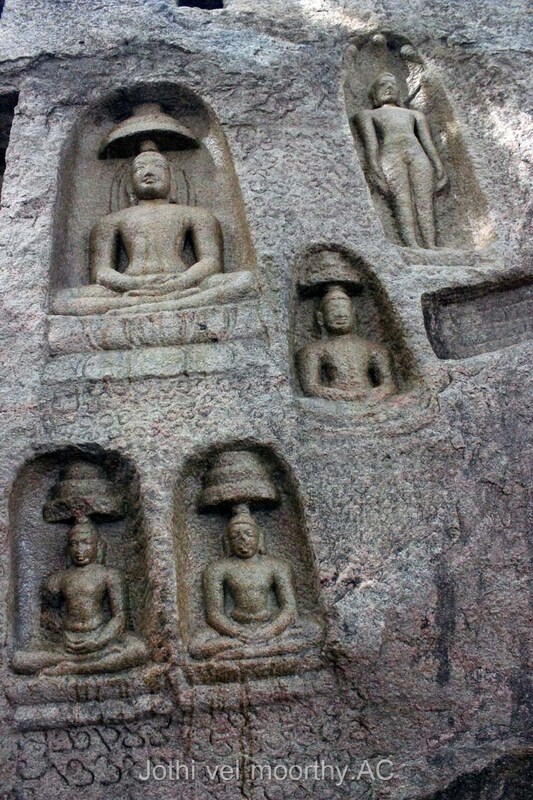 Kazhugu malai, located approximately 21 kilometers west of Kovilpatti, features relief-carvings of Jinas and Jain deities across the surfaces of its rock formations. 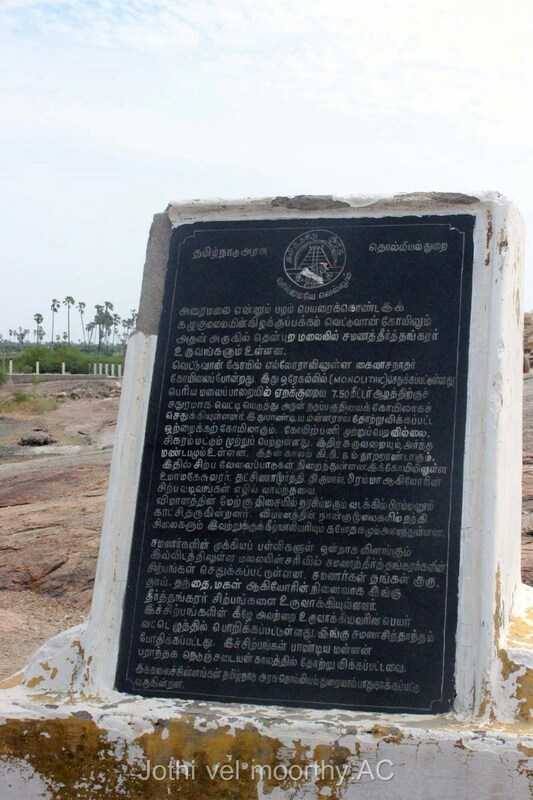 The village may have got its present name from the hill Kazhugu malai (“Hill of the vulture”). 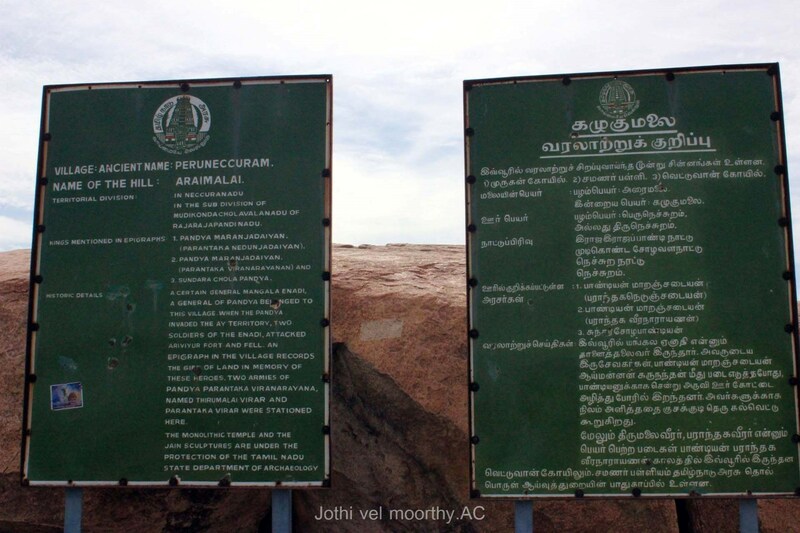 Earlier it was known as Araimalai or Thirumalai. 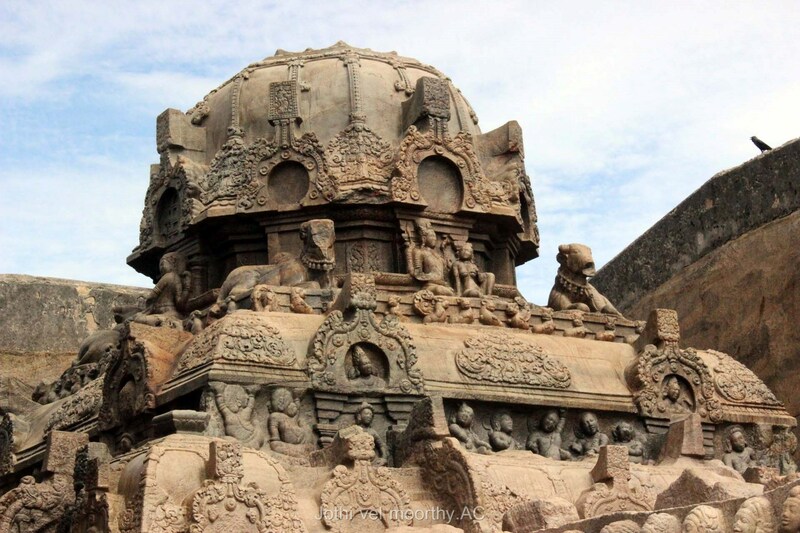 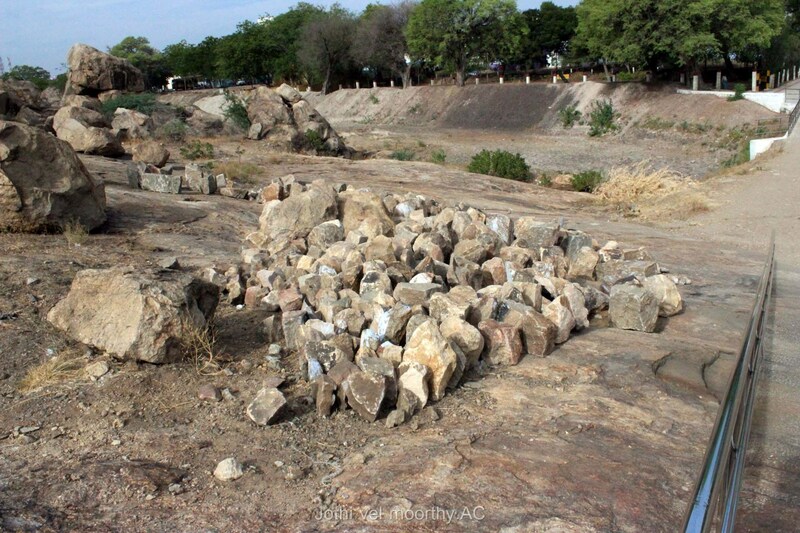 Unlike structural and rock-cut temples that clearly transform the environment from a natural landscape to one dominated by a man-made structure, the boulder site of Kazhugu malai highlights the irregularities of the rocky terrain. 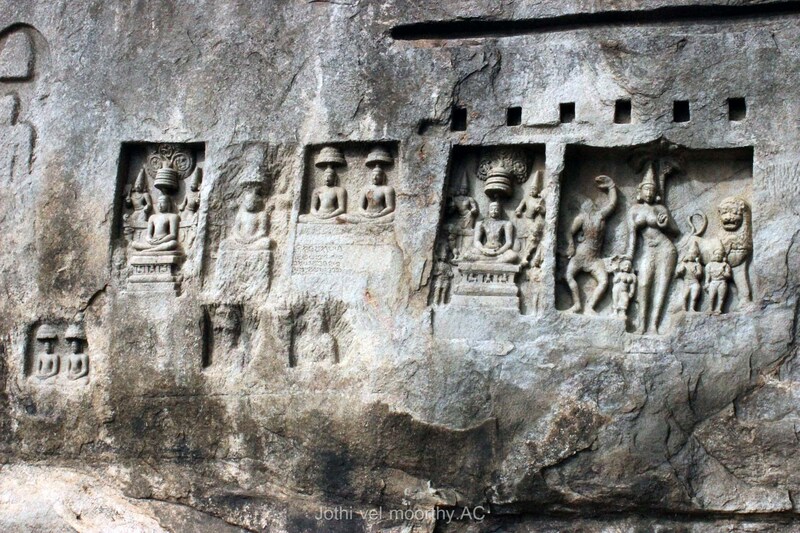 The reliefs are incised on various rock formations that are located at the apex of an outcrop of stone that rises some six hundred feet above the town. 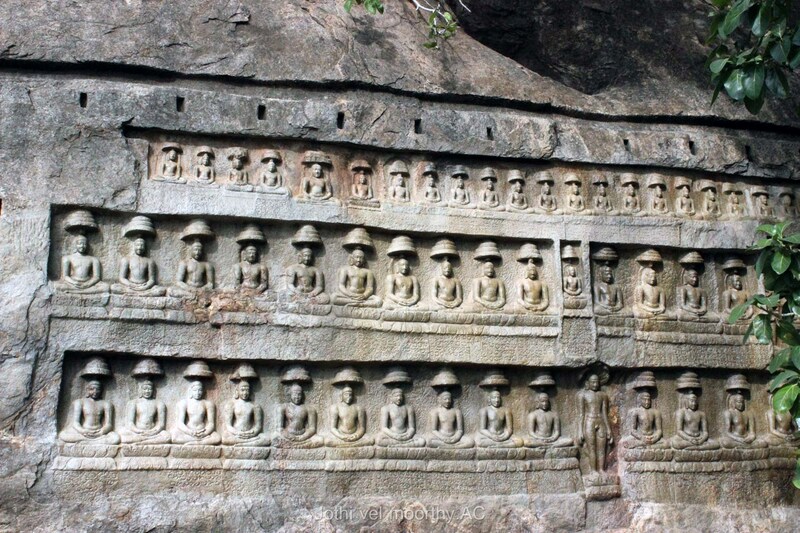 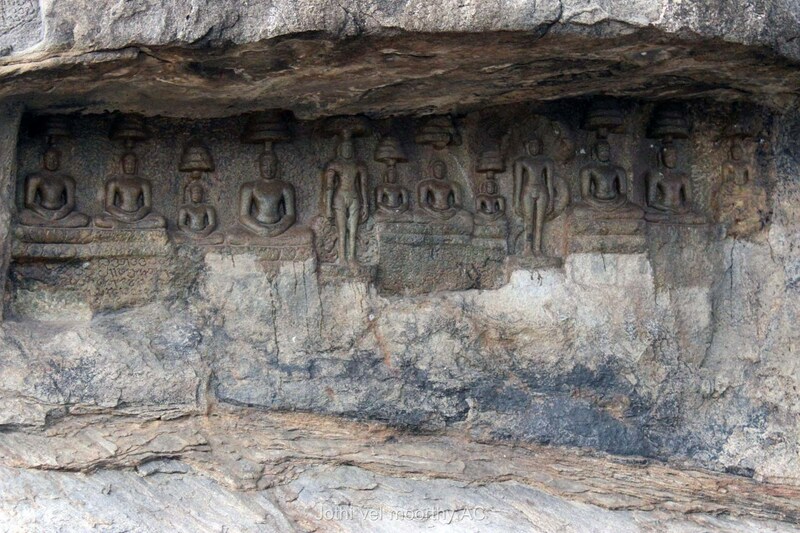 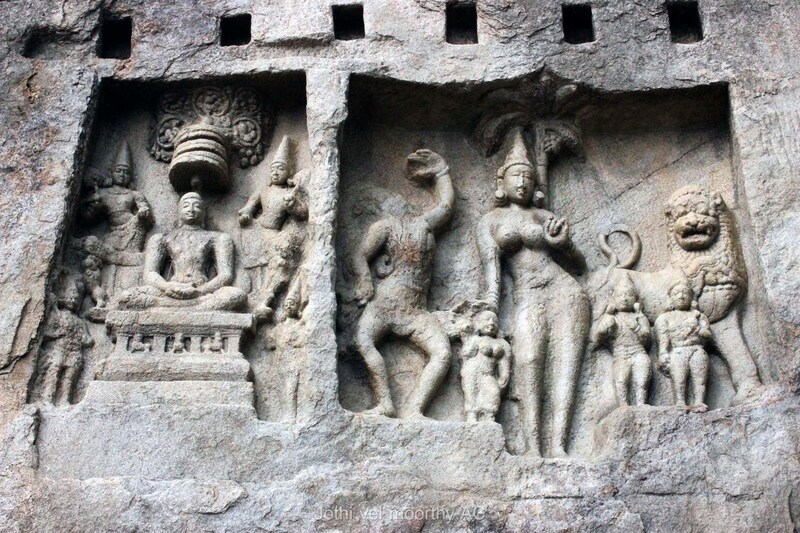 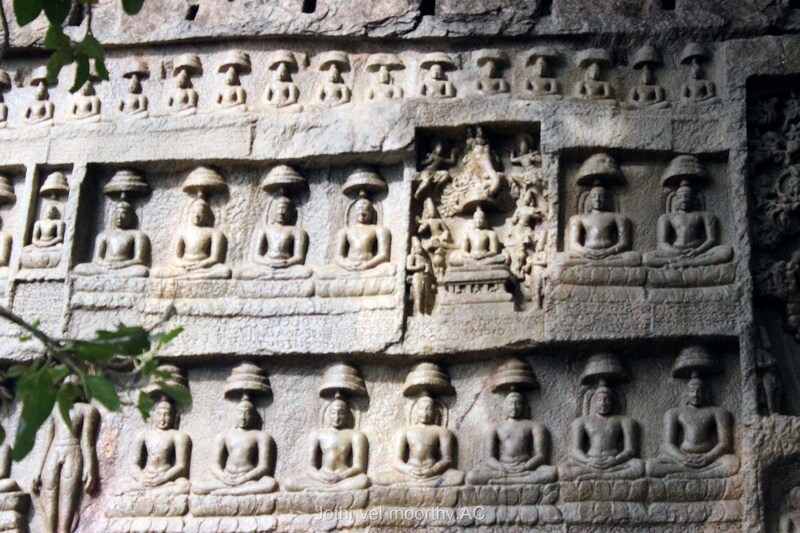 There are many relief sculptures dating to the 8th-9th century A.D. in the area, including the rock cut image tirthankaras. 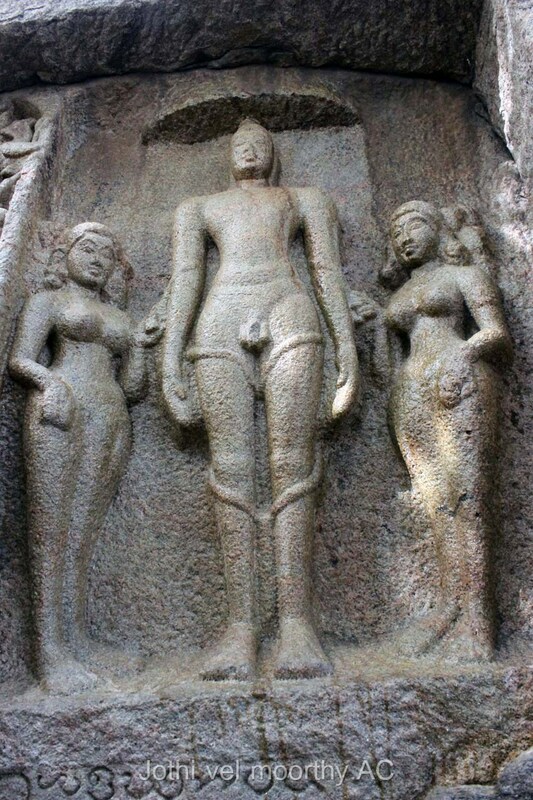 Godess Ambikā is presented as a two-armed goddess and stands with her right hand resting on the head of a small female attendant. 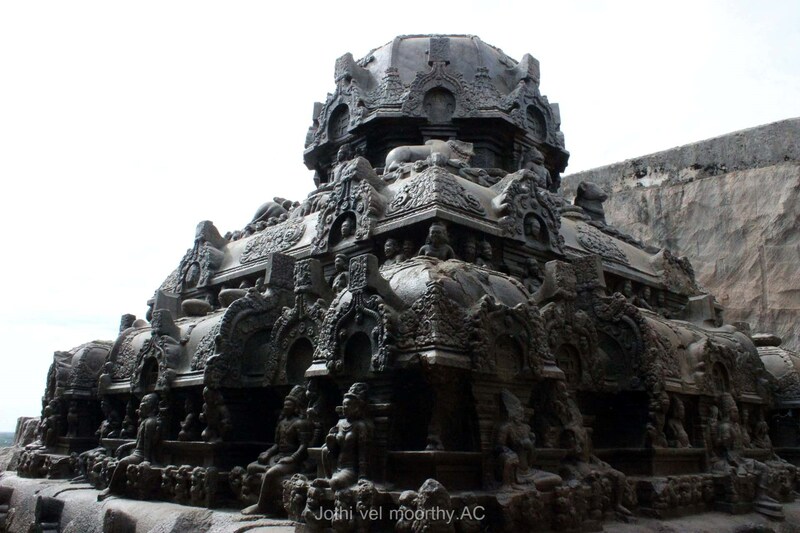 Vettuvan Koil is a Hindu temple built between the 8th and 9th century. 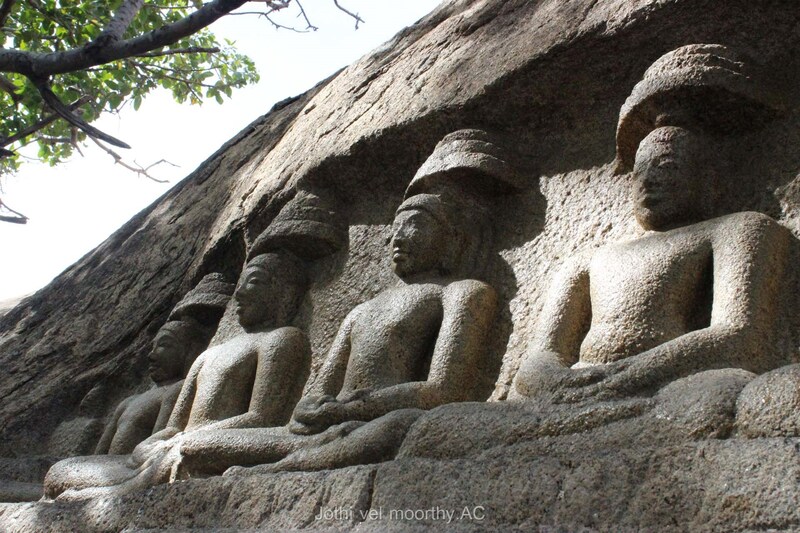 Kalugumalai is a priceless unfinished Pandyan monolith cave temple, part of the iconographic richness that helped chronicle the burgeoning richness of the Tamil culture, traditions, and sacred centers containing religious art. 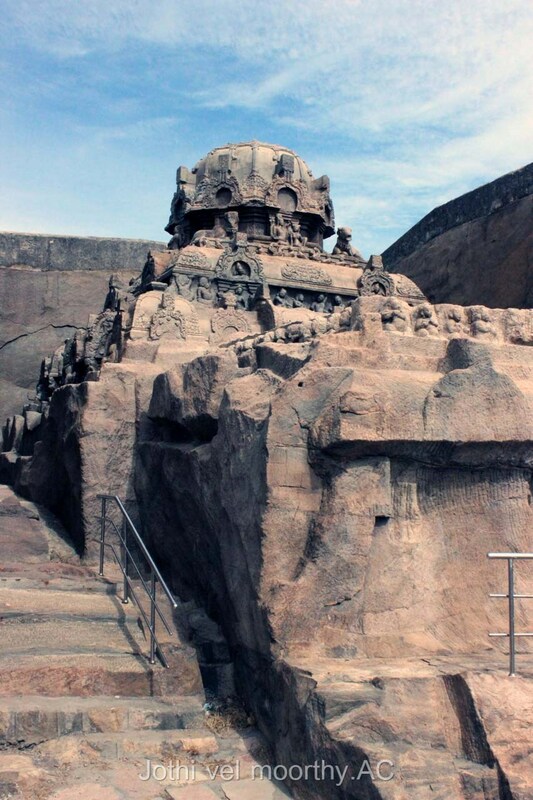 About 7.5 meter of the mountain is excavated in a rectangular fashion and in the middle the temple is sculpted from a single piece of rock. 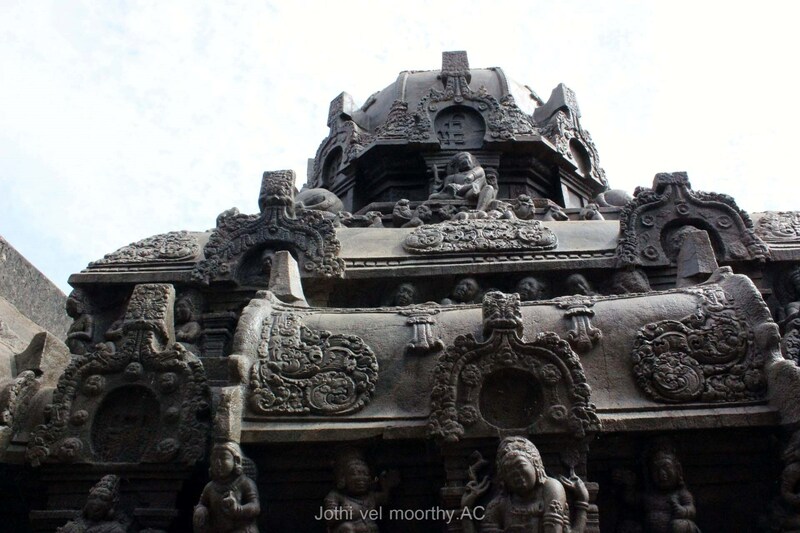 Only the top portion of the temple is completed. 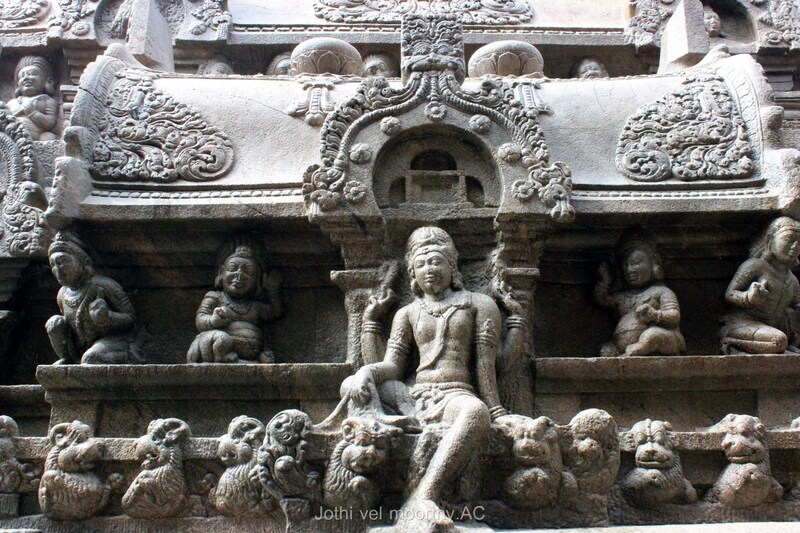 The temple has an entrance and centre hall for the main deity. 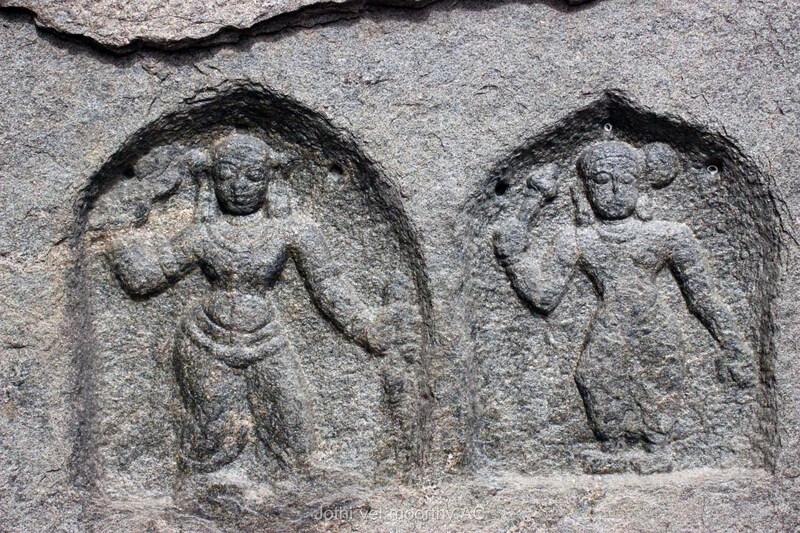 In the later days Ganesha’s idol is kept and worshiped. 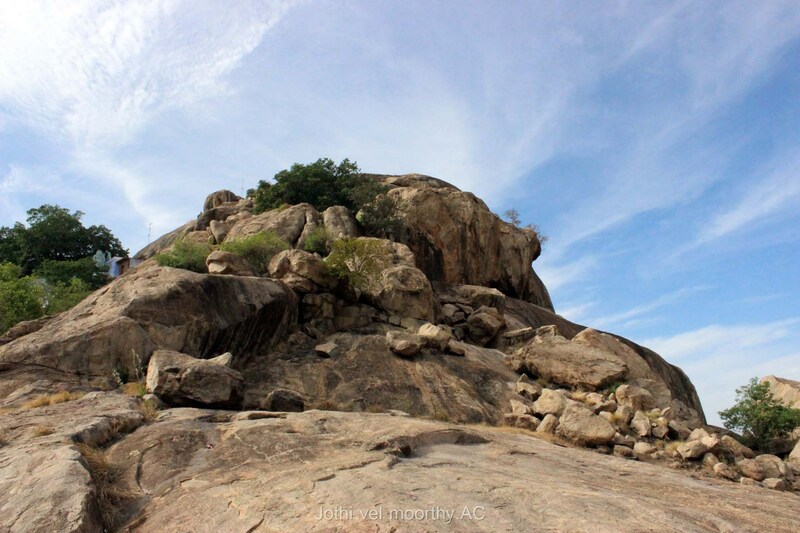 It is significant to note that the rock formations at the top of the hill remain unaltered, with the exception of their surfaces. 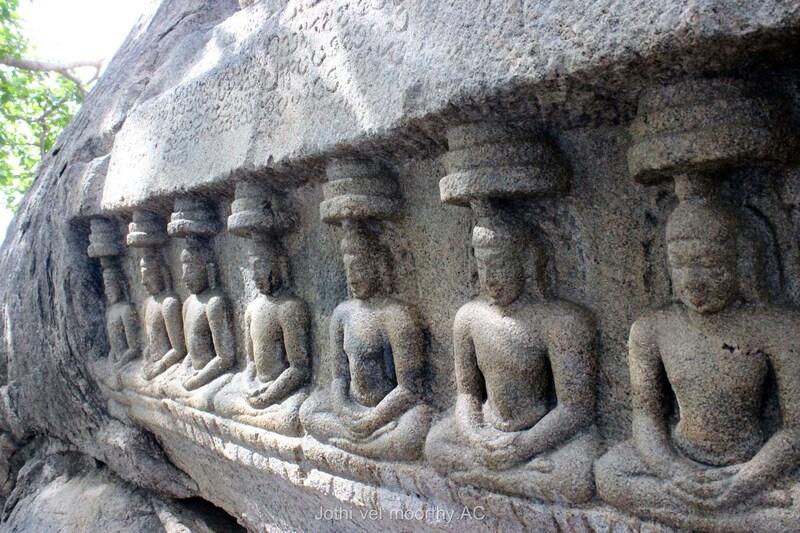 In fact, one cannot easily separate the natural form of the boulder from its carvings. 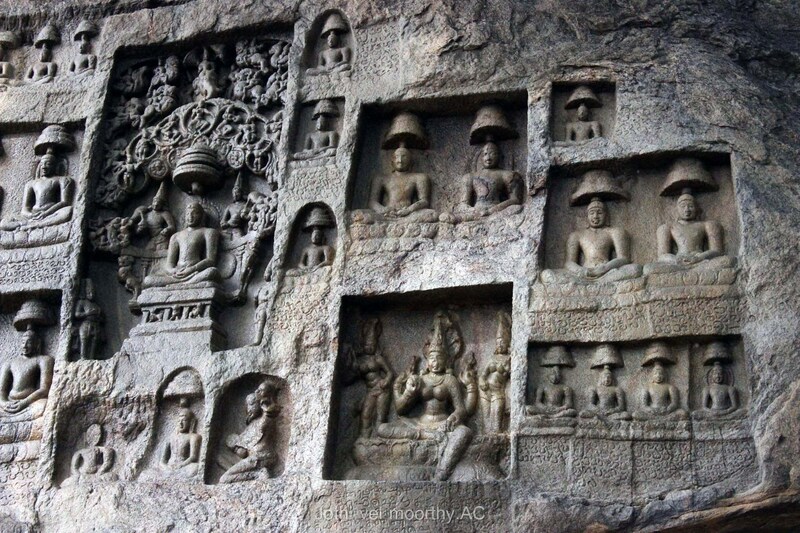 In other words, the reliefs tend to enhance the natural shapes of the rocks rather than modify them. 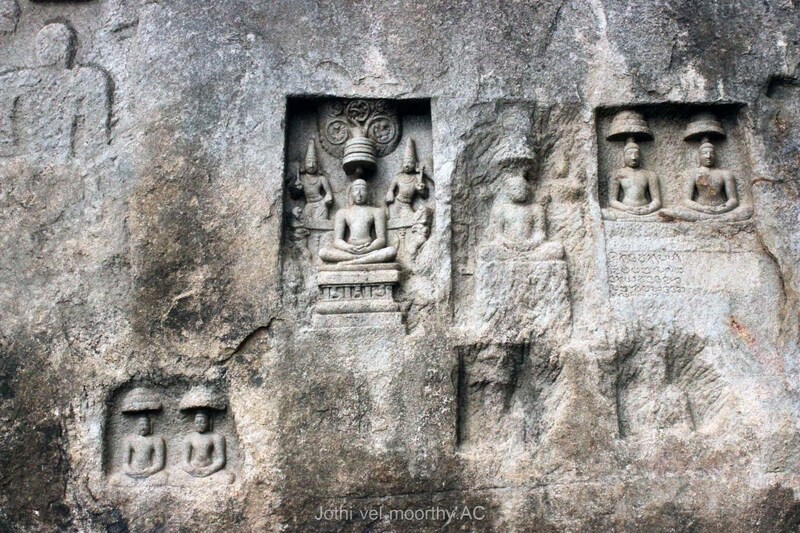 While these carvings still occupy a prominent place in Kazhugu malai, they have today received only limited scholarly attention. 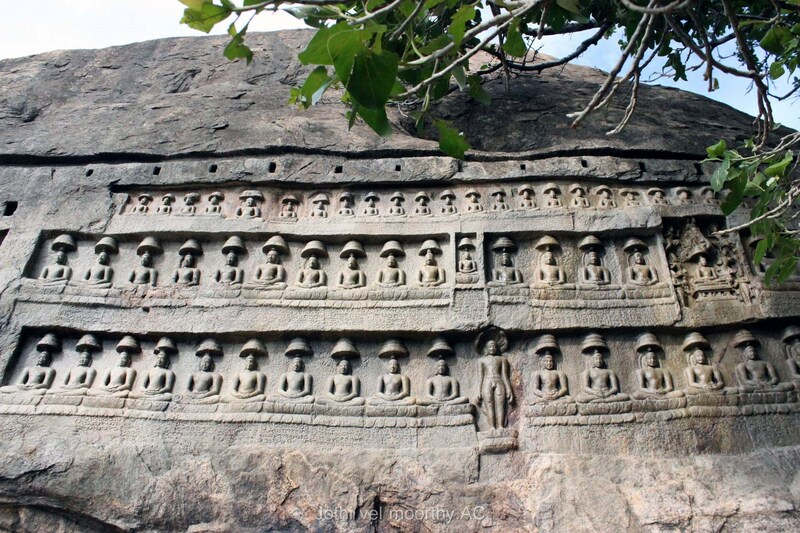 Contributing to the relative neglect of this type of monument is the remote location (usually at the top of a hill or steep precipice) and the seemingly sporadic program of images that are carved on the boulders. 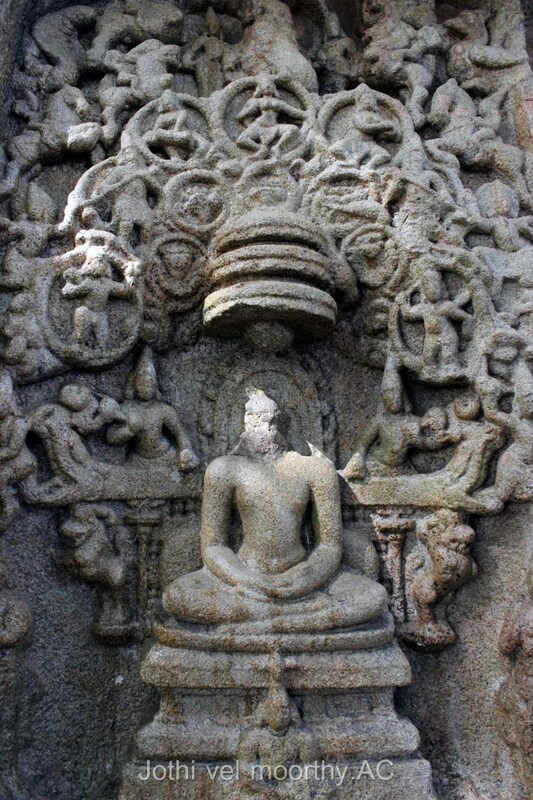 It is indeed noteworthy that Jain presence and the demarcation of sacred space for devotional activities are not articulated by carving a temple (which could have been done), but by transforming the landscape through imagery. 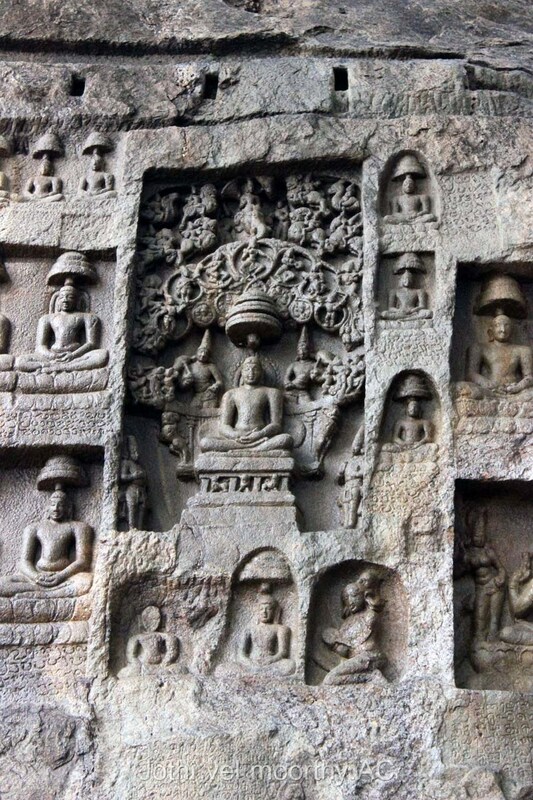 It is a sacred space that is not created internally, but rather it extends outward and upward, broadcasting the power of Jain art and devotional practice beyond its immediate vicinity. 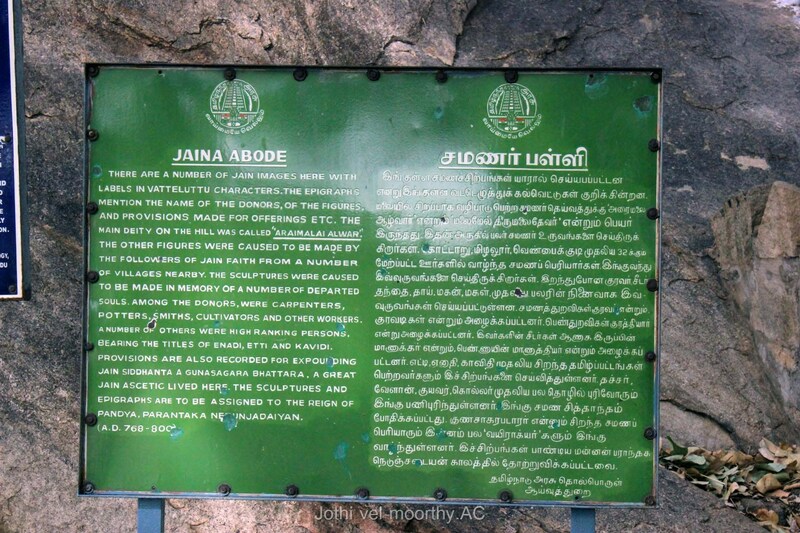 It is this “power of place” that links many of Tamil Nadu’s boulder sites together, thereby providing a foundation from which to view and better understand these monuments. 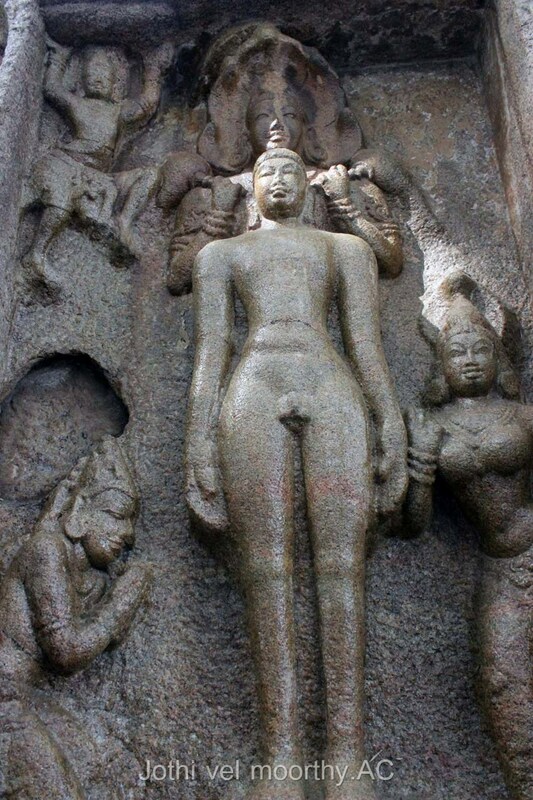 It was really a great feast for my lens and started descending as the sun become scorching!